D810A DSLR Camera (Body Only) is rated 2.5 out of 5 by 6. Rated 5 out of 5 by Mike from Great camera for astrophotography and nightscapes Plan to use the camera for wide field nightscape time lapse videos, as well as taking deep sky photos through my telescopes. I am impressed by the dynamic range of the images that I have taken with it so far. Attached is an image I took with a Rokinon 14mm lens showing five planets visible in the morning sky just before dawn. Also takes great daytime photos. Did not notice any strong color shift. Things that could be improved - a tilt/swivel LCD screen would be beneficial for when it is connected to a telescope. It also is pretty big and heavy compared to the Canon DSLRs I have used in the past, so you need to make sure your telescope mount is up to the task of the extra weight. Rated 5 out of 5 by Anonymous from A nice start for Nikon in the AstroImaging area! Due to the lack of clear skies I have only had limited opportunities to use this camera for astronomical use. In between clouds I was able to snap off a few wide angle views of Orion (just a few seconds) and I was impressed by the amount of detail captured. The fast ISO speeds and low noise has made it easy to capture more detail in faint light situations. Indoor photography has also proven to be above par. There has not been a need to use the flash and the images comes out actually better using a higher ISO setting rather than a flash. It seems the flash has caused almost a faded look to some of the objects a few feet away. The battery life has been excellent! I just ordered extra batteries and an AC adapter for my astronomical projects. The only disappointment was not with the camera itself but rather how this camera has NOT been bundled with a standard FX lens of some sort. There are a lot of features on this camera and I am sure its going to take some time to learn all of the nuances! So far, so good! I am so glad to see Nikon enter the Astronomical arena! Rated 1 out of 5 by Anonymous from It will get five stars when Nikon supplies the drivers neede Nikon D810a review Camera will be great but to use it for astro photography (specifically designed to photograph the night sky) Nikon must supply the drivers for the mounts (mine being a Bisque Paramount MyT) or else the D810a will be useless and I will have made a very big expensive mistake. I was surprised/shocked Nikon had not done this before they released the camera. Cannon, with their astro camera seems to be on top of this, but Nikon now has the superior chip and has got to get those drives out ASAP. When that happens and the drivers are correct, the D810a will get five stars. Rated 1 out of 5 by Anonymous from Horrible sports focusing Purchaser be aware if you're planning to use this camera to shoot action shots. Worst Nikon of the many I have owned to shoot sports. Awesome for still shots, great negs, etc., bot almost impossible to get the body to keep up with the action. 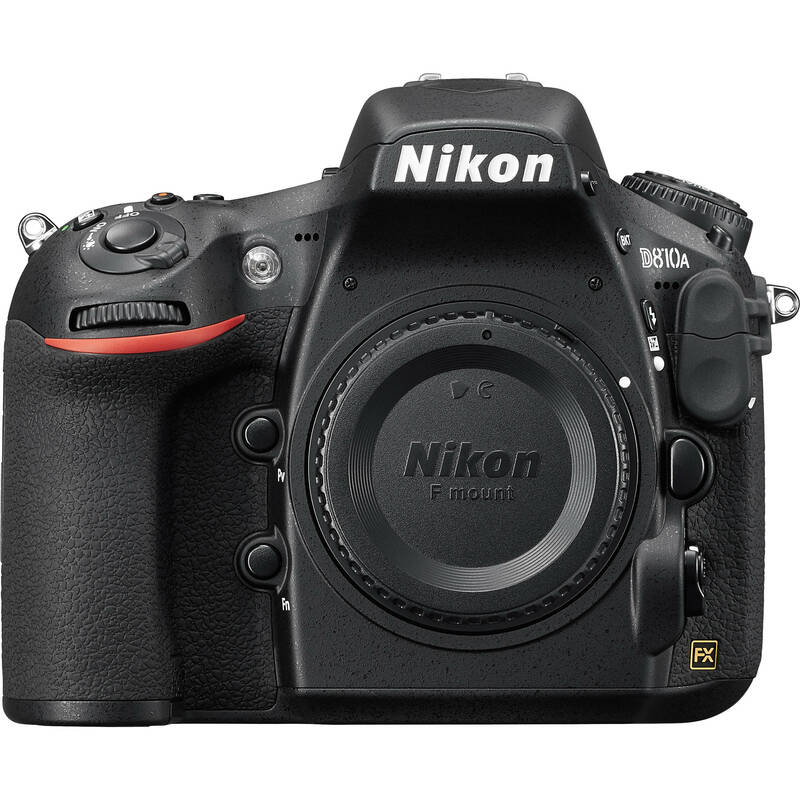 Currently the Nikon D810A DSLR Cameras originate in Thailand. The pixel pitch of the Nikon D810A DSLR Camera is 4.88 m.
Can I still use camera in temperatures below 32 degrees? Yes. I have used the camera down to 4 degrees F, or -15 degrees C. The battery life may seem shortened. One additional effect I have found is that the LCD screen may go blank in the cold when the battery said it was 50% charged. I tough the LCD was broken. It worked fine when I put a new battery in. I can see in the overview that this camera is not recommended for general photography because of a reddish cast that may appear under certain lighting situations. Could this be prevented using for example a IR filter in the lens? I have used the 810A for landscapes in the daytime and see no noticeable red effects. I use Canon and Nikon cameras, and there is more difference between the Canon and Nikon cameras than there is between the 810A and other Nikons. can the d810 also be used for daytime photography? Is this a good backup camera to the D810? Yes. It seems to me that the S/N at high ISO is actually better than on the 810, as per many reviews. The red cast does not seem to be an issue to me. Perhaps it would be better to say that the 810 could be used as a backup to 810A. Does the 810A photos exhibit less noise than those produced by the 810 at the same settings? I use Nikon's 200mm F2.0, 300mm F2.8, and 500mm F4.0 primarily, as well as prime focus on a Celestron 11. This summer I will try some wider angle photos of the Milky Way. The telephotos can be used wide open, but the wide angle and normal lenses I have need to be stopped down a little bit to avoid coma in the star images near the edge of the field.